Work on the construction of the RM3 billion Second Penang Bridge has begun with the completion of much of the preparatory work. The soil investigation work, which started in August, will be finished this month while topography surveys were completed in September and underwater survey works a month later. In a statement released by Fox Communication Sdn Bhd here today, a China Harbour Engineering Company (CHEC) spokesperson said that test piling began last month and to date, the company had completed three clusters of seven piles each. Dredging was undertaken to deepen the seabed to allow the piling barge access into shallower waters. CHEC and UEM are jointly constructing the 24km-long Penang Second Bridge that will link Batu Kawan in Seberang Perai to Batu Maung on the island. UEM subsidiary, UEM Construction Sdn Bhd, has formed a consortium to build the bridge, with CHEC holding a 51 per cent stake and UEM the remaining stake. 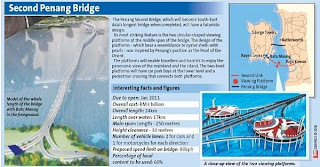 The Second Bridge will ease traffic congestion on the Penang Bridge which is currently handling 110,000 vehicles daily, surpassing its 80,000-vehicle capacity. -perlu ke pembinaan jambatan penang ke 2 ni di jalankan? -mmg la sesak...tak membazirke smpai 3 bilion tu? -kalau dibina selain dari jmbatan ke 2 ni ok tak? -monorail ke..yg masih belum ada di pulau pinang?